I spent the weekend at Mid-Ohio, and I had trouble with water temperatures. The event before, I was hitting about 220F in the last session Saturday, then pretty consistently on Sunday. Since then, I put Singular Motorsports hood louvers on the car. This weekend, I started hitting 240F mid-day Saturday. Oil temps were about the same, 240F. That evening I took the thermostat out, wondering if it was stuck. I also used some zip-ties to seal the undertray up to the bottom of the radiator better. I have my water temp sender in the steel coolant hose coupler underneath the ECU box. I'd test it, but I don't know who made it, so I wouldn't have specs anyway. So I might as well replace it, just in case. Honestly, the engine bay doesn't...'feel' or 'smell' hot. You know what a cooked engine is like. I'll pull the water pump, and maybe even throw in a spare I have. But those things are pretty simple. I have little confidence it failed. I'm also considering underdriving it. I know there is some suspicion the stock pump just churns at high RPM. And mine cools the hell down as soon as I back off. Is that because there's less heat being put into it, or because the pump can do its job? I have no idea. Eventually I'll duct the radiator, like John Santiago did on his. Did the dashboard temp gauge move at all? I have had a heck of a time getting my Prosport water temp gauge to read anywhere close to the factory gauge. Could be a bad sensor like you said. Things to check: are both fans working, each with two different speeds? Are your rad hoses and air separator tank in good shape? 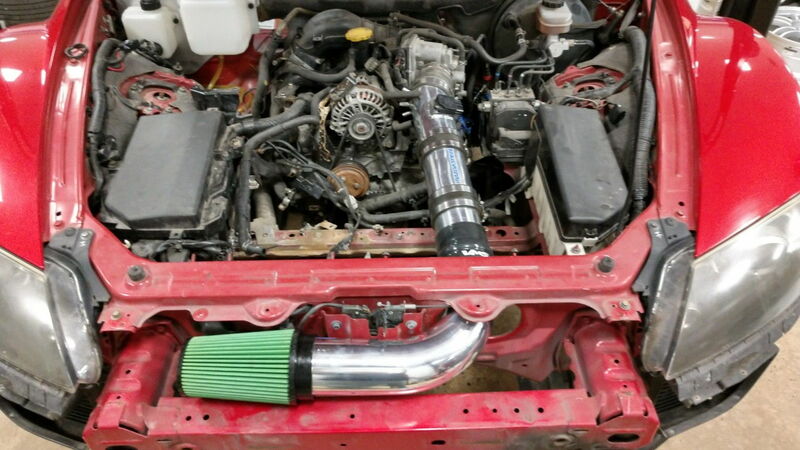 Is it the stock radiator? How many miles on the coolant? Its possible something is floating around in there and blocked a passage. The stock pump is known to cavitate (make bubbles) at high rpm. When it does that, it stops moving water efficiently. Mazmart pump is supposed to correct that and flow more at middle rpm, but I have not seen a true A to B comparison on flow characteristics. Its not my money to spend, but Id look at that before underdrive pulleys. Gotta look at the whole system. Weird that the vents made it worse or maybe that is a coincidence. What coolant are you running? Definitely check the pump, but a stock pump shoudl be fine if it is in good order. I had a Mazmart pump and it made zero difference so I removed it and still run the stock pump. But I have a dual pass radiator and a secondary radiator. Also, is there anyway your radiator or condenser is gunked up and restricting flow? It's something a lot of people don't think about but I have seen dirty radiators over heat vehicles fairly often. Are you still on a factory radiator? How many years old is it? Have you read your ECT reading from ODB2 port to confirm that the 240 is correct? I placed my temp sender in my upper radiator hose because my turbo manifold was too close for comfort by my lower radiator hose. My prosport temp gauge in my car consistently reads 10 degrees warmer then the factory ECT sensor near the thermostat housing (to be expected). I also ran the hood louvers and it really did seem to help especially at stop lights where I could see all of the heat vaporizing out of the passenger vent where the turbo sat. At medium and high speeds, I could read no difference in temps. I now have the stock hood back on as it is rainy in Florida and the Supra now gets prime garage real estate. Yeah, I don't think the vents actually made the problem worse. I think that they just had no effect because something else is the problem. I am using 'Zerex Asian Car' coolant. Both fans kick on at the stock temperature setting. I have no condenser. It's a race car. :) I also have no stock water temp gauge. The whole stock dash is gone. The radiator is a Koyo. Is is dual-pass? I don't know. I still have the CSF radiator from my old car. It got a little banged up on one side during the rollover, but it may be worth pressure-testing and putting into service. Hosing the Koyo radiator out makes sense. The previous owner did have screens in front of it to block larger debris. It's definitely not full of leaves or OPR. Assuming your radiator is functioning correctly, I bet your water pump is cavitating. I believe the stock one cavitates over 6 or 6.5k, which is probably where you spend the majority of your time on track.... We put Speedsource pulleys on my car (they underdrive the water pump), along with the Koyo radiator, and noticed a big improvement in cooling. We just autocross so it is less extended high rpm time than what you are doing, but last year (stock system) we were seeing 215+ pulling back into grid on a hot day (and our coolant overflow was also spewing coolant all over the place), and this year we are at 199 pulling back into grid in even hotter temps. I am of the Remedy religion.... Fair warning.. I had high RMP temp spikes (untragauge) and the low coolant light would come on (foam will not float the little floaty thing, foam = cavitation). Rememdy stopped it. I am also now running CSF, new hoses, and lower oil cooler thermostats (factory is like 212+, did not open in boiling water). My track days are like Tamra described. I do not really see 200 any more. Underdrive to slow stock pump down is an option, remedy is an option. It would be nice if someone tried underdrive and posted. I was having issues as well last weekend, though ambient temps were up high enough that I had to pull my phone off the dash and my ultraguage was constantly beeping at me until I turned its temp alarm off. I run the koyo hh rad, lower temp water and oil thermostats, aluminum undertray, and I cut a bunch of holes into the front plastic grill in front of the radiator. Temps got over 220 fairly easily, though the track was extremely technical with only one straight (NCM west circuit). It was my first hot event with the car (90+ deg F) and first time at that track so I can't be sure how much the track layout contributed. Pockets - can you relocate your battery and remove the factory intake? If so then I've heard that helps since it opens up the back of the radiator for more airflow. My battery is in the trunk, and I have the AEM/Mazdaspeed intake. I also have Singular hood vents. I’ve ordered a new water pump. When I get back in the country I’ll pull the current pump out and see if it’s failing in any obvious way. When I loaded the car before the last weekend, there was a rattle at the front of the engine. That may be related. Subscribed out of interest. I vented my hood recently and also saw high temperatures last weekend. Not sure higher or lower than the stock hood would have been, but I'm very unimpressed. Works well at autocross to get heat out in grid, but maybe I need some leading edge flaps to drop the pressure in front of the openings. I know... I'll add pics later. since it's a track car, are you running water only with water wetter or using antifreeze. i dont like the mazdaspeed intake because it blocks so much of the radiator. that's why i moved my intake up top like teamrx8. What hood did you use, hufflepuff? i know at least one local guy with rx8 that confirm his coolant temp dropped 10 degree with hood vents on track. i haven't check coolant temp on my car, i'm waiting on Aim solo DL to release so i can use it as coolant temp gauge with oem sensor. A thought, pull the gasket at the rear of the engine bay, the one that goes against the hood. I know others who have added a small block to the center to raise it even more. Half an inch by 4 feet is a pretty good hole. The hood-windshield corner is a high pressure area though. It will flow into the engine compartment, not out of it. I've got to imagine that with the air flowing into the engine bay that pressure inside would be greater than any exterior point along the trailing edge of the hood. Underhood air has many exit points, including the fender gills, which are in low pressure areas. That and there isn't a clean air path from the radiator to the back of the hood. Since none of these are closed cyclinders, we're talking about dynamic pressure which requires airflow. I don't see much airflow happening along the inside of the back of the hood. That gasket is already absent from my car. The car has antifreeze in it. But I'll likely be draining it anyway to do the water pump when I get back. 'While I'm in there...' I'm also going to take the radiator out and make sure it's not jammed up with debris. I could also do some fin-straightening. I may have remembered something I did that could have contributed to my water temperature problems. In a pinch, I think I may have added a coolant to my system that may not have mixed well with what was in there. Specifically, I think I mixed the green that was in there with some pink Mercedes coolant, premixed with water. That may be really bad. Go ahead and shake your head at me. Anyway, I'll flush out the cooling system this weekend. But what to fill it with? I figure it's time to just go with straight water with a corrosion inhibitor. I understand some people like Redline Water Wetter. Any recommendations? It may not do this when added to straight water, but when I put water wetter in (with 25% coolant mix) it formed sludge particles which I noticed after only a couple startups and then drained the system...then I noticed it left a ring of thick tar-like residue in the drain bucket. Good ole Mazda FL22. Definitely nothing with 2-EHA content, if you don't want FL22 for some reason. We know it doesn't cause problems. The other options are at your own risk. FL22 for sure. Proven and recommended. I appreciate the endorsements for FL22, but at some point I do intend to take comp school and go wheel-to-wheel. I’ll have to go straight water eventually. Who told you that you had to run straight water to take comp school ? Yes, you can run straight water, but your coolant boiling point will be lower AND you'll corrode the inside of your engine and destroy your water pump.